Saman Munir is a Canadian vlogger who teaches hijabis to be beautiful inside and out. Salaams my lovelies! Jumah mubarak to you all. It is Friday, which means another Follow Friday post. Today, I want to feature Saman Munir from Saman’s Makeuphijabs YouTube channel. Not only is she beautiful to look at, she is also a hijabi fashion vlogger who teaches her fellow hijabis how to not only look their best, but feel their best too. This hijabi fashionista is also a full time mommy and part time hijab stylish and makeup artist. If you have a chance, check out her Instagram account @makeuphijabs for the most beautiful hijabi style inspiration. She has an eye for putting together colorful yet feminine outfits that anyone can try. I call her style accessible elegance. What I love the most about Saman Munir is her ability to connect with her viewers in her YouTube videos. While her chiseled features makes her beauty especially striking, she shares personal stories of her own struggles such as being considered the ugly duckling in her family, or her weight gain/loss journey that allow her viewers to be able to relate to her. In the end we are all the same like most hijabi vloggers, but Saman Munir has this uncanny ability to make viewers feel like she is a hijabi next door that they can have chai with and ask beauty/hijab advice. Her online tutorials are especially helpful. If you ever need help with styling a difficult yet beautiful hijab like the Neva hijab, make sure to check out her fool proof tutorials. Her makeup tips are also easy to follow and she uses tools that most women possess (which is helpful since Sephora is like a sticky fly trap for me). I really love that her looks are never too extreme and that they always look pretty. On top of having a YouTube Channel and an amazing Instagram account, Saman Munir also sells hijabs and accessories online too. What a Wonder Woman mashallah! Make sure to check out Saman Munir and let me know what you think! Finding a bra that fits is important if you want to keep your fashion modest. What item can instantly slim you and help you have better posture? A proper fitting bra. In terms of modest fashion, most hijabi fashion bloggers/vloggers focus more on the actual outfit or accessories, but what about under garments? No matter what your body type, having the right under garments such as Spanx, bras, or slips can actually help set the tone for your entire outfit. Think of under garments as the essential foundation of your outfit. Personally, if you wear items that help smooth over trouble spots and wear under garments like slips, you actually stay more modest too! Whenever I see my skirt is too sheer, a slip always does the trick. As a curvy hijabi, having the right bra is important. You want to invest in one that fits properly so you can avoid jawline cleavage, quadriboob (when your cups runneth over), and back bulges. Bra shopping may be a pain because you may not even know your true size. In fact, 85 percent of women wear the wrong one, according to a 2011 study conducted by Griffin Strategic Partners. Well if you don’t know your size, Jockey has created a new way to get fit for bras that is absolute genius. Jockey recently introduced the Jockey Bra based on a Volumetric Fit System that allows you to measure yourself at home. 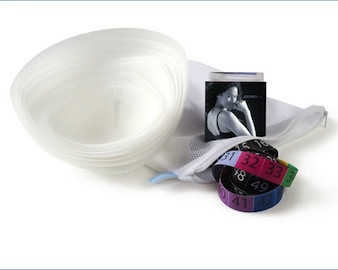 The bra-sizing kit, which you order online for $20, includes plastic, breast-shaped measuring cups in sizes 1 to 10, a color-coded measuring tape, a lingerie wash bag, and a $20 coupon to put toward a Jockey bra. To determine your size, you choose a cup and lay it on top of your breast. If there’s gapping, you try a smaller cup; if there’s spillage, you try a larger cup. Repeat until you find the best fit, then measure your ribcage. I actually fit myself at the local Jockey store near my home. I ended up with the most comfortable bra I have ever owned. No more back fat, no more spillage, and no more gaps! Yes, it was expensive for me to buy, but this under garment was worth every penny since it ends up making me look skinnier and that is priceless right? I am joking, but jokes aside, my shoulders, neck and back are all thanking me for better distribution of weight. Your body is a gift from God, so please take care of it and try a better fitting bra. If wearing Jockey is not your thing, you can also be fit at any Victoria’s Secret store too. Their Body collection is also very good. If you are interested in trying the new sizing system but don’t live close to a Jockey store, order a Jockey Fit Kit here. Please note, that I did not get paid or given anything to share this with you. I just happen to really love this bra! I hope you do too. Jeweled kaftans add just the right amount of glitz of glamour while still being modest. I have a confession to make: I love to look stylish, but comfort and convenience often seems to win out in my personal battle of comfort vs. style. I love how some hijabis can put some effort and time into looking so beautiful, but for me, it is a challenge to ensure my toddler is dressed (and allows me to comb her hair)! Forget about me! What is a mom with an active toddler to do? I truly don’t want to wait till my babykins is in her 20s to start looking good. The answer to this dilemma of comfort vs. style is a jeweled kaftan. My dirty little secret is that you can always don a jeweled kaftan over your pajamas. I kid you not ladies. I was running late to a dinner party and had no idea what to wear since I literally had 10 minutes to get ready. So I threw on a jeweled kaftan over my pajamas and voila! I was instantly dressy without having to do much else. The hostess pulled me aside to tell me how beautiful I looked and well that always makes anyone’s day right? I happened to buy my kaftan from a specialty hijab shop in Lilburn, GA while I was visiting my sister, but there are plenty of places you can find a nice kaftan to wear for weddings and special occasions. If you are an online shopper, make sure to try out Mohajababes. They have a large selection of beautiful jeweled kaftans. I also love that they help support one of my favorite organizations as a featured designer: Fashion Fighting Famine. Make sure to check them out and let me know what you think! I will be posting a review on their kaftans, hijab accessories and hijabs soon inshallah! Admit it, you avoid talking to your work colleagues at all costs when you are fasting. You talk to your toddler only to have your toddler scrunch up her face and say “ewww Mommy!” You pretend to turn your head to peruse magazines when you ask a cashier a question. Yep, you have kung fu fighting Ramadan breath. And while you know that it smells sweeter than musk in theory, you also know that you would prefer not to have to speak with anyone in the practical sense. I will not be missing my Hubs’ Ramadan breath as he asks me when Iftar will be ready! Sorry Hubsy. I still love you, Just at a distance. Perhaps it is because of my toddler, But I am not a fan of how my toddler insists on staying up with me while I did my tarawih and Quran recitation at night. I am also no spring chicken, so going to bed late only to wake up a few hours later did not give me a “Ramadan glow,” but more like Ramadan bags under my eyes. Trust me, at my age, staying up late definitely is apparent. But was it worth it to get closer to Allah (swt) in my own way? Definitely yes. But for the sake of the kids at my daughter’s preschool, I am glad I won’t be scaring them with my zombie appearance any more. Okay, so this one is totally my fault. In my parents’ native Bangladesh, we welcome Ramadan with deep fried goodies like beguni (eggplant fritters), samosas, and piyaji (lentil fritters). I could have said no to making these fatty fried items, but it just didn’t feel like Ramadan to me without them. So I am glad to bounce back to my clean eating ways. And I am making a Ramadan Resolution to fight against the urges to serve fatty dishes during Ramadan next year inshallah. Pray for me, since this one will be a toughie! I am going to be real: it is near impossible to exercise during Ramadan. Yes, I know some of you fitness buffs can do it, but us regular mortals need to find the time between iftar and suhoor (which means sacrificing precious time from tarawih and extra worship such as tahajjud or Quran recitation). Yes, our body is an amanah (trust from God), but will Allah (swt) really ask me about my triceps (no, so I choose the extra worship hands down). That being said, I definitely need to get back to shape after Eid inshallah. No more fried foods! Okay, this is more about Eid, but I will be happy to see those masjid goers who love to fight at the masjid take a chill pill. This one always gets me because we all know that the real reason we don’t know when Laylatul Qadr (Night of Power) is was because there were Muslims arguing! So why are we not learning that important lesson of NOT fighting? This list is silly, but really, no matter what I say, I will miss Ramadan. You never know if this will be our last Ramadan, so please make the most of these last days. 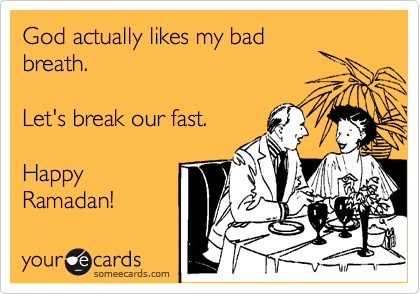 And make sure to pop a mint after you eat Iftar! As a working mom, sometimes you have to make a quick yet nutritious meal that doesn’t require too much effort; especially on a work night. I have found this Ramadan to be especially squeezed for time with the later Iftar timing as well as late night tarawih plus an early suhoor time. So last week, instead of making traditional items like pakoras and samosa, I decided to base our Iftar around one kitchen staple: Greek yogurt. You see, non fat plain Greek yogurt is amazingly versatile. 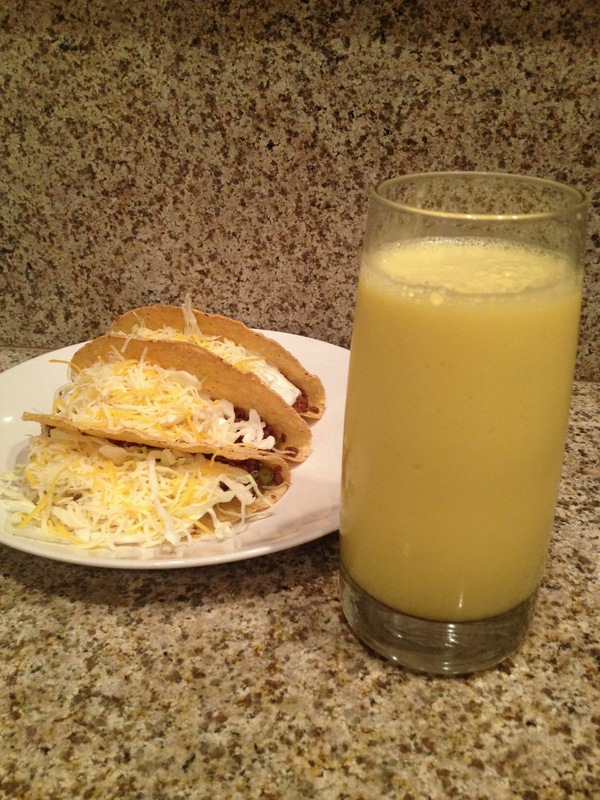 You can replace sour cream with it (as evidenced by my taco night photo). It is also very soothing to eat after a whole day of fasting. Greek yogurt sort of coats your grumbling tummy with a nice cooling sensation. It’s also delish! I used it to also make mango lassi. For those of you who have not tried mango lassi, it is almost like a rich, thick, mango smoothie. The richness in my lassi came from ripe mangoes and the Greek yogurt. It feels sinful like a milkshake, but it’s definitely much better for you! Try it for Iftar and let me know what you think. 1) Peel and dice the mango and puree in the blender. 2) Add the rest of the ingredients and puree until the ice is crushed and the drink is a smoothie consistency. Imane Asry’s unique Swedish take on hijab is refreshing. Salaams my lovelies! Jumah mubarak to you all! This is the last Friday of Ramadan this year which always makes me a little sad since there are countless blessings on days like today but they are gone before you know it. Let’s make this Friday count inshallah! As you know, I typically do a Follow Friday post on my favorite Instagram accounts. Today, I would like to introduce you to Sweden’s Iman Asry, aka Fashion With Faith (@fashionwithfaith). Why do I love Imane so much? She is definitely not a hijabi who takes herself too seriously. She posts amazing photos of her funky style, yet she also posts real life pictures of her time with friends and family. Did I mention she has a wicked sense of humor too? Her silly faces pictures are just as interesting to me as her “high fashion” pictures on her account. She makes being a stylish hijabi that much more accessible to regular hijabis like me. That is not to say she isn’t stunning. I mean look at her pictures! She has a fresh faced beauty that is refreshing to look at. It is hard to find someone who does not resemble any one else in the hijabi vlogger world, but Imane is able to stand out with her mix of vintage with high fashion pieces. She also makes me realize I have a wealth of stylish options in my closet already. With her styling, you can certainly come up with outfit combinations that you may have forgotten about. Her recent pictures reminded me I can reuse my Doc Martens from the 1990s with stripes versus the flowers I had paired it with in the past. Who says you can’t bring back fads? Make sure to check her out on Instagram @fashionwithfaith and let me know what you think!